Once considered a leading builder of automobile bodies this totally forgotten firm produced carriages and automobile coachwork for Manhattan’s elite in the late 19th and early 20th Century. The firm was organized in 1896 by Henry Burr Barnes, the second son of Alfred Smith Barnes and Harriet Elizabeth (Burr) Barnes. Born on December 14, 1845 in Brooklyn, N. Y., Henry attended the Williston Seminary at Easthampton, Massachusetts, the Brooklyn Polytechnic Institute at Brooklyn, New York, and eventually Yale College, from which he graduated with an A.M. degree in 1866. He subsequently entered business with his father in the famous publishing house of A. S. Barnes & Co., and on January 1, 1869, was admitted to the partnership. He married in Brooklyn, N. Y., June 16, 1869, Hannah Elizabeth, daughter of Courtlandt Palmer and Hannah Elizabeth (Williams) Dixon and sister of William P. and Ephraim W. Dixon, and had three sons and three daughters, the sons all being Yale graduates, in 1893, 1902, and 1910, respectively. From 1876 to 1880 he edited The International Review, one of the era’s most prestigious periodicals. In January, 1891, a large portion of the firm’s book list was purchased by the American Book Co., and became a director of that firm. In December, 1895 he bought a controlling share in what remained of the old firm, which was once again began publishing under the as A.S. Barnes & Co. imprint, admitting his son Courtlandt to the partnership in 1905. The senior Barnes was also connected with other business enterprises, being vice-president of the Barnes Real Estate Association, and since 1896, president of the Barnes Carriage Co. of New York. It is that business enterprise with which we are interested in here. For many years Manhattan’s Western Blvd. was popularly known as Upper Broadway, the change being made permanent by New York Mayor Robert A. Van Wyck, who renamed Western Boulevard north of Columbus Circle “Broadway” in 1899. The June 22, 1903 issue of the New York Times reported that as of May 27,1903 Henry B. Barnes Jr., the son and namesake of the firm’s founder, was now a full partner in his father’s carriage business, which would continue under the same name. Henry Burr Barnes Jr., (b. Sept. 15 1872-d.Nov. 20, 1951) was born in Stonington, Connecticut on September 15, 1872 to Henry Burr and Elizabeth (Dixon) Barnes. His siblings included Elizabeth William (b. April 1871), Priscilla Dixon (b. June 1875), Sarah Palmer (b. Feb. 1878), Courtlandt Dixon (b. June 1881) and Thomas Sloan (b. Aug 1889) Barnes. After a private education at Everson's School, New York City, he attended Yale College, receiving a B.A. in 1893, after which he intermittently attended the Columbia University Law School, finally receiving his L.L. B. in 1897. In a 1907 listing of its membership, the Carriage Builder’s National Association (CBNA) lists H.B. Barnes as a member. Other than the occasional classified advertisement, little was heard from the firm until the Summer of 1907 when a friend and distant cousin of the Barnes’ joined the firm. The new partner, Alfred Loomis Curtiss, had embarked upon an identical course of education as his cousin, Henry Burr Barnes Jr., receiving his B.A. from Yale College in 1896, and his L.L. B from the Columbia University Law School in 1899. Alfred Loomis Curtiss was born on July 23, 1874 to Addie (Beers) and Henry Wheeler Curtiss. His father was a partner in the Manhattan silk importing firm of Hoeninghaus and Curtiss. Henry Wheeler Curtiss was born in Monroe, Conn. in June of 1845 and came to New York where he found employment with the his cousin’s book publishing business. His cousin just happened to be Alfred Smith Barnes, the founder of the famous school-book publisher, A.S. Barnes & Company. Henry Wheeler Curtiss worked for the firm from 1867 to 1881 when he entered the silk business. He and his wife Addie (Beers)(b. April 1849) had two children, Maude H. (b. May 1871) and Alfred Loomis (b. July 1874) Curtiss, our subject. “Mr. Sherrill states that a finished machine is never sold to wealthy patrons directly, such wealthy patrons preferring to have their automobiles built in New York, by either Demarest or Brewster, and but for this fact both of these well-known and reputable houses would have failed. “To characterize this statement as absurd is rather mild, but in refuting it we will content ourselves in referring your Committee to the statistics compiled by the Appraiser and Collector of the Port of New York during the last five years. These will show that fully 30% of automobiles imported were imported by individuals who had purchased abroad, and that the bodies were built by such well-known body-builders of Europe as Rothschild et Cie, Kellner et Cie, Audineau, Vedrine and others. Of the other 70% of motor vehicles imported by dealers and agents an unbiased investigation will show that the work has been pretty well divided between J. M. Quinby & Co., Burr & Co., R. M. Stivers, Barnes Carriage Co., Kimball & Co., Flandrau & Co., Rothschild & Co., Studebaker Bros., Willoughby, Schildtwachter, Healey, New Haven Carriage Co., Blue Ribbon Carriage Co. of Bridgeport, and many other American carriage makers. 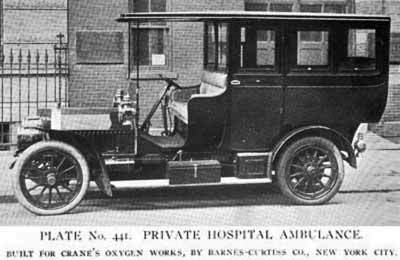 “The accompanying cut shows an interior view of a very handsome limousine type of a private ambulance built by Barnes-Curtiss Co., Inc., 147-149 West Ninety-ninth Street, New York City, for The Crane Oxygen Works, New York City. “The side view of this car is shown in Plate No 441 from which it will be seen that exteriorly this car has the appearance of an ordinary high class limousine and there is no indication of its being a hospital ambulance. 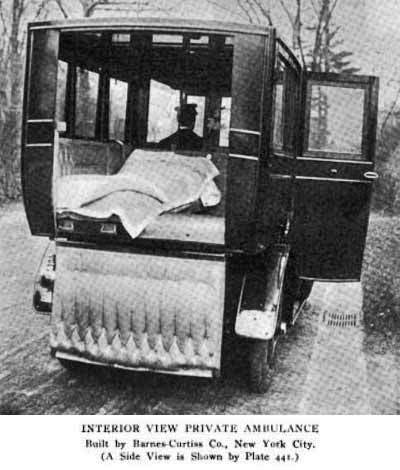 The interior however is arranged to be convertible into an ambulance with every facility for the comfortable transportation of invalids to and from railroad trains, steamers and from dwellings to the hospital. By a pair of lever catches operated from the inside of the body, the rear lower panel drops down permitting easy access for the stretcher bed shown in the picture. This bed takes up less than half the interior space thus making it possible for the physician and nurse to accompany the patient. “In the front right hand corner is carried the cylinder of oxygen and under the rear seat in the right hand side is a galvanized watertight ice compartment. The stretcher, constructed of ash framework with cane bottom on which the mattress is placed, has a movable section at the head where it rests on a small shelf in the body itself, so that the patient may lie in any position desired. This stretcher is fitted with two brass lifting handles at each end. “Henry Burr Barnes, head of the publishing firm of A. S. Barnes & Co., died suddenly this week at his home, 112 East 56th Street, New York City, from apoplexy. “Mr. Barnes was born in Brooklyn on December 14, 1845, and was the son of Alfred S. and Harriet Elizabeth (Burr) Barnes. He received his preparatory education at Williston Seminary, Easthampton, Mass., and in 1866 was graduated from Yale, being the historian of his class. The same year he entered the publishing house of A. S. Barnes & Co., which had been founded by his father, and in 1868 was made a partner. 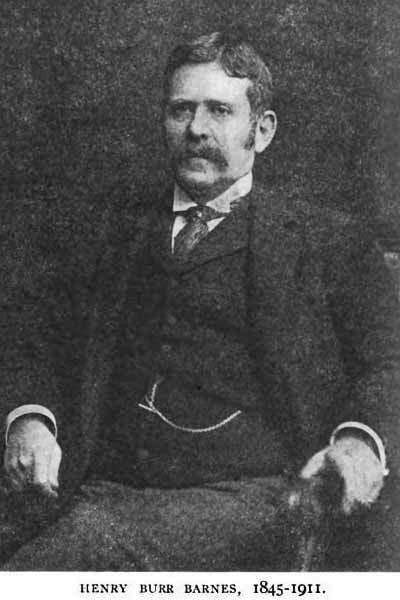 He became head of the firm in 1896. The firm disappeared from the list of active automobile body builders shortly afterwards. A 1922 article in the Times lists Thomas A. Williams as the proprietor of 147 West Ninety-ninth Street, his line of work unknown. “HENRY BURR BARNES, B. A. 1893. Born September 15, 1872, Stonington, Conn., died November 20, 1951, Gettysburg, Pa. Father, Henry Burr Barnes, 1866, a publisher, A.S. Barnes & Co.; editor, International Review, director, American Book Co. Mother, Hannah Elizabeth Williams Dixon. “Yale relatives include Charles P. Williams, 1862 (great uncle); William P. Dixon, 1868, William D. Barnes, 1880, Ephraim W. Dixon, 1881 (uncles), Marshall J. Dodge, 1898 (brother-in-law); Courtlandt Dixon Barnes, '02, Thomas Sloane Barnes, '10 (brothers), many cousins. “Everson's School, New York City. Oration and dissertation appointments, Yale Union, treasurer, Y.M.C.A. Junior year, Students' Conference, Northfield, 1892, editor, Yale Daily News, Senior year, University Club, He Boule; Psi Upsilon, Scroll and Key. “Student, Columbia Law School, 1893-94, travelled in Europe, 1894-95; student, Columbia Law School, 1895-97; LL. B. 1897; admitted to New York Bar, 1897, with Miller, Peckham & Dixon, New York City, 1897-1911, partner, Moen & Dwight, 1911-28, vice-president and director, Barnes Real Estate Assn., secretary and treasurer, 1911-16, president and treasurer, H. B. Barnes Real Estate Corp.; vice-president, Yale Leasing Corp., 1916-17, member, Workshop Committee of New York Assn. for the Blind, Metropolitan Museum of Art, American Museum of Natural History, vice-president, South Harlem Neighborhood Assn., chairman of the Board of Deacons and secretary, Men's Bible Class Fifth Avenue Presbyterian Church, government appeal agent, Local Board for Divisions No. 147 and No. 164, New York City and State, 1917-28, moved to Stonington, Conn., 1933, deacon, Congregational Church, Stonington, Conn., 1936; moderator, New London Assn. of Congregational Churches and Ministers, 1939; presented Yale Library with a set of bound copies of International Review for the years which his father was editor, 1940; returned to New York City, 1943, member, East Side, Y. M. C. A., Republican Club of Fifteenth Assembly District, Reform Club, University Club of New York, Phi Delta Phi, American Bar Assn , New York City Bar Assn., Philharmonic Society, League to Enforce Peace; Yale Club. “Married March 27, 1911, New York City, Mabel Irving Jones, daughter of Edward Renshaw Jones and Mary Elizabeth Baldwin. Children Henry Burr, Jr. (B. S. Harvard ‘33); Edward Jones (B. S. Harvard '39), Alfred Smith.